WinnerS' CubE... © 2010 Andamiro. The objective of WinnerS' CubE... is remarkably simple. Players will be controlling the movement of a slim rod that is mounted onto a motorized mechanism with two buttons that control the horizontal and vertical movements of the rod. Once the button is released, the movement of the rod will stop at the location of the desired position. Players will have 20 seconds to plan, and position the rod so that it is aligned to an opening hole of the prize display. 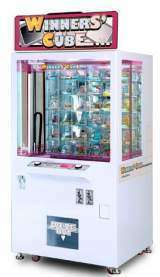 Once the rod is positioned successfully, the motorized mechanism will proceed to extend the rod into the hole where it will push a prize off the clear display shelf and drop the prize into the redemption basket. The complete design and construction of the Winners' Cube follows a transparent thematic design that portrays a clean-suave, modern look and feel. Luxurious exterior design & brilliant interior lighting effect makes Winners' Cube the ultimate attraction in every location. Redemption prizes are displayed through a gigantic transparent display and white lights are used to illuminate the prize shelves with a glamorous attitude. 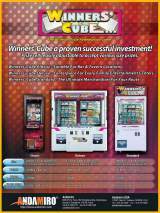 With captivating music and mesmerizing looks, Winners' Cube proves to be an already won investment in any environment.